Send us the data of your solar system. 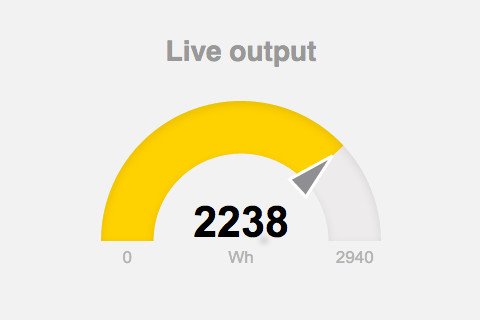 Create an account and get an overview of your energy output in cool graphs. In just a few steps you are ready to go. Setup the enecsys gateway so it will send us your inverter data. Log on to your gateway by connecting to the ip-number of your gateway. You'll find the ip number on the lcd-display of the gateway under ENECSYS. Enter the ip-number of your gateway into the field and hit 'Open'. The default username for the gateway is admin and the default password is password. Hit the button Apply New Settings. In just a few minutes the icon on the bottom left on the LCD-display of your gateway should show 2 connected screens. That means your Gateway is connected with our server. If you see a cross in the icon with the 2 screens, then your gateway has no connection with our server. If your gateway is not connected then please check our FAQ. Some features we are offering in our monitor. Find all the anwsers to your questions. Or contact us when you have any other question. This website is for everybody who has solar panels with Enecsys Inverters. Enecsys, the company who build the inverters, doesn't exist anymore. The monitoring Enecsys offered is also not available anymore. This website with the monitoring service is an alternative for the Enecsys monitoring. We are in no way connected with the former company Enecsys UK Limited. Which inverters do you support? Currently we only support Enecsys Generation 1 inverters. At this moment we have no intention to support Generation 2 inverters. Can you garantee that this service will be available in the future? The founder of this website and monitoring service has build it to get an overview of his own enecsys solar system. We can not predict what will happen in the future, but we guess that this service will be online for a very long time. What are the credentials of the Enecsys gateway? Why do I have to give you the serialnumbers of my inverters? Each inverter has a unique serial number (e.g. 110011110). The gateway is sending us data from every inverter with the serialnumber as unique identifier. So if you won't tell us which inverters you have, we cannot show you any data in the monitor. Go to http://[your gateway ip]/ajax.xml and get the values between <deviceN>. Each value is a hexadecimal presentation of the serialnumbers of your inverters. Click here to open a website where you can convert the hexadecimal values to the serialnumbers you are looking for. 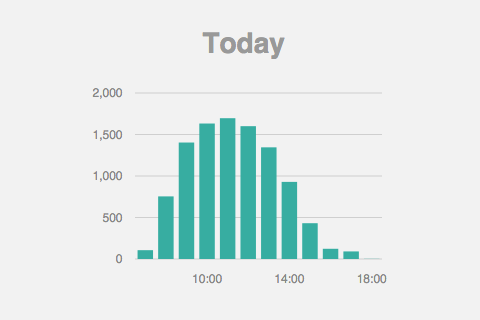 It takes up to 30 minutes before new registered inverters are whitelisted in our monitoring service. When your inverters are approved in our service, the data will be collected. First of all, check if the serialnumber is correct. If so, then it is possible that your gateway is not getting any data from the inverter. In that case the inverter and gateway reset their communication during night, so check if the inverter is showing data during the next day. If your inverter serialnumber is correct and it is not showing data for a few days, then it could be broken. We advise you to let a professional take a look at it. Why can you show me lifetime data in the monitor? Every inverter has a counter that represents the total power (watt) that the connected solar panels collected. Every few seconds we receive the updated total power of an inverter. With that in mind we can present you lifetime data and also current data that gets updated every few seconds. Al the data we collect is used for this service only. We are not sharing your data with anybody else. We are also not using the data for any other meaning then giving you insight in your solar system through our monitor. 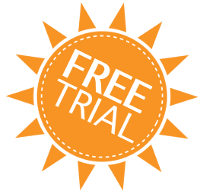 Register today for a 30 day free trial period. Get a performance overview of your enecsys inverters in just a few minutes. or create a free account. The service "EnecsysOutput" is offered over the internet in the form of Software-as-a-Service by the company S&Mann. The use of EnecsysOutput is subject to the below terms and conditions. Using EnecsysOutput constitutes acceptance of these terms and conditions. Deviations from these terms and conditions is possible only by means of written confirmation by S&Mann. 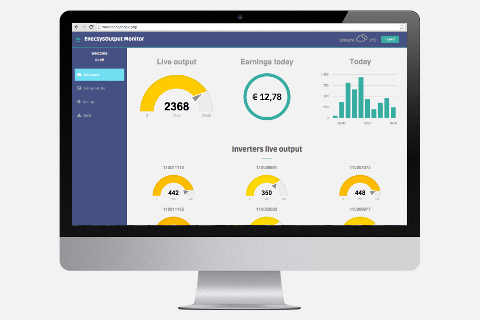 1.1	The service EnecsysOutput allows you to monitor the energy output of your solar panels through the use of one or more inverters and a gateway of the brand Enecsys. 1.2	To use EnecsysOutput, you first need to register. After completing registration, you can directly log into your account and use the service. 1.3	You must secure access to your account using the username and password against third parties. In particular you must keep the password strictly confidential. S&Mann may assume that all actions undertaken from your account after logging in with your username and password is authorized and supervised by you. This means you are liable for these actions, unless and until you have notified S&Mann that someone else knows your password. 1.4	EnecsysOutput allows you to process personal data. S&Mann acts as a processor as that term is defined in the Dutch Data Protection Act; you are the controller. You indemnify and hold harmless S&Mann against all claims by third parties in connection with this Act. 2.1	S&Mann uses its best efforts to have the service available at all times but makes no guarantees about uninterrupted availability. 2.2	S&Mann actively maintains EnecsysOutput. In case maintenance is reasonably expected to negatively impact availability, S&Mann carry out such maintenance at times when use of the service is relatively low. Maintenance is announced in advance whenever possible. Emergency maintenance can take place at any time and without prior announcement. 2.3	S&Mann may from time to time adapt EnecsysOutput. Your feedback and suggestions are welcome but ultimately S&Mann decides which adaptations to carry out (or not). 3.1	The service EnecsysOutput, the accompanying software as well as all information and images on the website is the intellectual property of S&Mann. None of these items may be copied or used without prior written permission of S&Mann, except and to the extent permitted by mandatory law. 3.2	Information you store or process using the service is and remains your property (or the property of your suppliers or licensors). S&Mann receives a limited license to use this information for the service, including for future aspects thereof. You can cancel this license by removing the information in question and/or terminating the agreement. 3.3	If you send information to S&Mann, for example a bug report or suggestion for improvement, you grant S&Mann a perpetual and unlimited license to use this information for the service. This does not apply to information you expressly mark as confidential. 3.4	S&Mann shall refrain from accessing data you store or transfer using EnecsysOutput, unless this is necessary for a good provision of the service or S&Mann is forced to do so by law or order of competent authority. In these cases S&Mann shall use its best efforts to limit access to the information as much as possible. 4.1	The use of EnecsysOutput is subject to a fee which is due every year. The fee must be paid in advance. 4.2	Payment is possible as explained further on the website. 4.3	Because the service is started directly at your express request, a payment cannot be refunded under the Distance Selling Act. 5.1	Except in case of intentional misconduct or gross negligence the liability of S&Mann shall be limited to the amount paid by you in the three months prior to the moment the cause of the damage occurred. 5.2	S&Mann is not liable for any damage resulting from configuration of the gateway based on the instructions that are made available through S&Mann’s website or any other way. 5.3	S&Mann uses its best efforts to monitor the output of your solar panels as accurately as possible. S&Mann is however, not liable for any difference between the actual output of the solar panels and the output calculated through the use of EnecsysOutput. S&Mann in no event is liable for indirect damages, consequential damages, lost profits, missed savings or damages through business interruption. 5.4	Damages may only be claimed if reported in writing to S&Mann at most two months after discovery. 5.5	In case of force majeure S&Mann is never required to compensate damages suffered by you. Force majeure includes among others disruptions or unavailability of the internet, telecommunication infrastructure, power interruptions, riots, traffic jams, strikes, company disruptions, interruptions in supply, fires and floods. 6.1	This agreement enters into force as soon as you first use the service and then remains in force for a year. 6.2	After this period the agreement is silently renewed with successive terms of the same period. If you entered into this agreement as a consumer, you may after the first silent renewal terminate the agreement at any time with a notice period of one month, calculated from the moment of the notice. Non-consumers can terminate the agreement by the end of the term indicated in the previous clause with a notice period of two months. 6.3	Please note: it is not possible to export data you store or process using the service. 7.1	S&Mann may change or add to these terms and conditions as well as any prices at the start of a new payment period (as defined in 4.1). 7.2	S&Mann shall announce through the service changes or additions at least thirty days before their taking effect. 7.3	If you do not want to accept a change or addition, you can terminate the agreement until the date the changes take effect. Use of EnecsysOutput after the date of effect shall constitute your acceptance of the changed or added-to terms and conditions. 8.1	Dutch law applies to this agreement. 8.2	Except to the extent determined otherwise by mandatory applicable law all disputes arising in connection with EnecsysOutput shall be brought before the competent Dutch court for the principal place of business of S&Mann. 8.3	For any clause in these terms and conditions that demand that a statement must be done "in writing" to be legally valid, a statement by e-mail or communication through the EnecsysOutput service shall be sufficient provided with sufficient certainty the authenticity of the sender can be established and the integrity of the statement has not been compromised. 8.4	The version of any communication of information as recorded by S&Mann shall be deemed to be authentic, unless you supply proof to the contrary. 8.5	In case any part of these terms and conditions are declared legally invalid, this shall not affect the validity of the whole of the agreement. The parties shall in such an event agree on one or more replacement provisions that approximate the original intent of the invalid provision(s) within the limits of the law. 8.6	S&Mann is entitled to transfer its rights and obligations under this agreement to a third party as part of an acquisition of EnecsysOutput or the associated business activities. Through its online service EnecsysOutput, S&Mann will process privacy-sensitive or personal data. S&Mann values the privacy of its customers and observes due care in processing and protecting personal data. S&Mann is the party responsible for all data processing. In this privacy statement, we will explain which personal data we collect and for which purposes. We recommend that you read it carefully. This privacy statement was last amended on 01-07-2016. 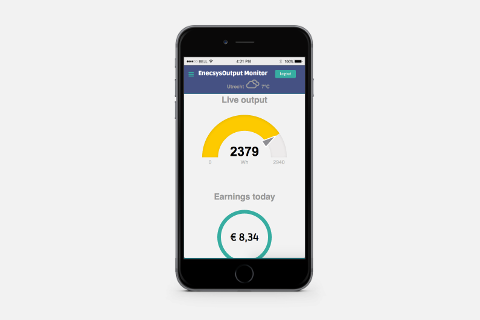 Via EnecsysOutput you can take out a paid subscription. We use Google Analytics to track visitors on our website and to get reports about how visitors use the website. We accepted the data processing agreement from Google. We don't allow Google to use information obtained by Analytics for other Google services, and we anonymize the IP-addresses.